How common are moles on the body? Everyone has moles, which are pigmented, fleshy blemishes of the skin. The average person has 10 to 40 moles on his or her skin. 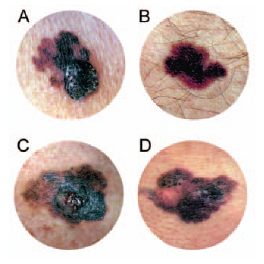 To check for trouble signs indicating melanoma, doctors check spots on the skin for A) assymetry; B) borders; C) colors; and D)diameter. Anatomical Chart Co.